Last week I introduced my all new blog series and in the introductory entry I talked about the pros and cons of introducing social networking to the educational environment. The series continues, looking at each network and it’s uses in the classroom! Facebook, for all its flaws, is still on top when it comes to the world of social networking with over 1 billion users (665 million daily active users). Facebook isn’t going anywhere. It is even predicted that within the next two years Facebook will have created and introduced Education Accounts. But why wait? Bringing a social networking site into the classroom can, understandably, be a difficult decision for any educator. There are many factors to take into account including your own safety and privacy. The number one rule I will provide: Never use your personal account! There are very easy ways around having to provide your personal account information to students. Creating a Page or Group for your classroom allows you to have conversations and share with students without giving them access to your information. They can send private messages through the page or hold conversations on the Page’s newsfeed. I suggest taking the time to understand the ins and outs of both Pages and Groups to find out what works best for your classroom. From there it’s just a matter of what you choose to do! Communication: A Facebook page or group opens up a common line of communication between students and the teacher as well as other students with questions. The digital environment can encourage more conversations and less cliques. Wallflowers are more likely to contribute and work together with others in this environment, allowing them a time to shine. A page also allows for absent students to stay connected and up-to-speed with what it happening in the classroom while they are gone. The can participate in online discussions as a potential way to earn class credit without being there (establish and enforce a rule on this early on and stick with it! Students may abuse the right!). A Page or Group on Facebook also allows parents to stay connected with what is going on in their student’s classes. Groups allow you to upload files so forgetful students have access to permission slips and other important documents via the internet and don’t have to stress about looking for it! This also allows you to share photos from class trips, classroom activities and other on goings! Parents won’t need to pry information from their kids in order to have a conversation about their day. 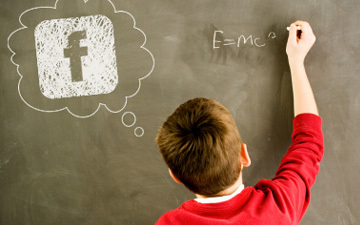 Apps: Facebook offers a large variety of apps that are perfect for the educational environment. There are 200 available apps, some developed by Facebook, others by outside developers. To save you from searching I found some great one’s through Brian Jenkins’ blog post at TeachHub! • Study Groups: Students use this popular application to work together outside of the classroom. They collaborate on group projects, share notes, discuss assignments, and help each other prepare for tests. • SAT Quest: This application prepares students for the SAT with short, five question SAT prep games. The questions become more difficult as students move to higher levels. • Quizlet: This handy tool is on of tne of the largest and fastest growing flashcard websites. Over 1 million registered users have uploaded tens of millions of flash cards. Flash card sets are available for a variety of topics including standardized test prep, languages, math, and science. • To Do List: Students use this application to organize their school assignments. Students can make multiple lists. • Zoho Online Office: Although it’s designed for businesses, this application is used by students to store their documents and class presentations online. They can then share their documents with other students. It’s a great way for students to manage their information. • Quiz Monster: Students create their own quizzes with this very popular application. • GRE GMAT SAT Vocabulary Flashcards: This application includes 5000 words students should be familiar with before taking the SAT. It also includes 1100 words for the GRE and GMAT tests. Students mark a word based on its level of difficulty. An easy-level word repeats after nine days and a medium level-word repeats after three days. Post Frequently: This keeps the conversations fresh and keeps them going. It begins to feel more like a discussion rather than notifications that can get lost in a student’s regular newsfeed. Post More Outside Information Then Class Announcements: Though many students won’t read these, those who do are invited to deepen their experience in your class. Connect What You Post To What You’re Teaching: In a few words, connect what you are posting (videos and articles) to what the class is learning and make it a part of the next class discussion. Don’t Make Facebook A Requirement: Many students may not be on Facebook either as a personal choice or the choice of their parents. Be sure to think of alternative ways to connect with students who may not be on social networks. Don’t Be Afraid of Inappropriate Use: By introducing an educational aspect of Social Networking to students many educators have found that it has become less of a distraction and allows students to understand how to responsibly use this technology. There is so much more to be discussed! Please use the comments section to share your own ideas, secrets or even do’s and don’ts you’ve discovered by introducing Facebook to your classroom!